2 Penny a day…or $1million? 3 Stocks A share in the ownership of a company. 100,000 shares outstanding in company You own 1,000 shares (100,000/1000) = 1% ownership. Types of Stock Common Stock Entitles the holder to one vote in the affairs of the company and one vote to elect the board members. Preferred Stock Usually doesn't come with the same voting rights as common stockholders. 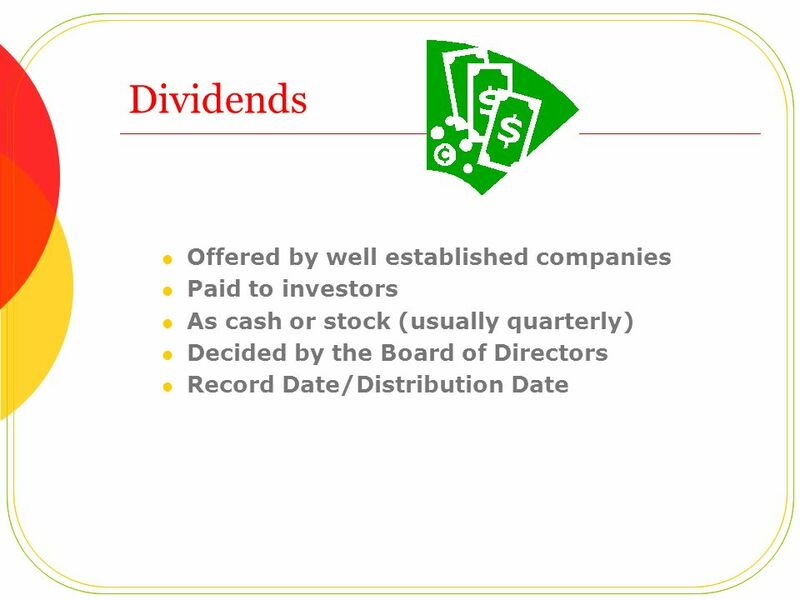 Receive a share of profits before common stockholders. In the event of company dissolution, preferred shareholders have a prior claim to assets ahead of common shareholders, but behind creditors. What is a Stock? 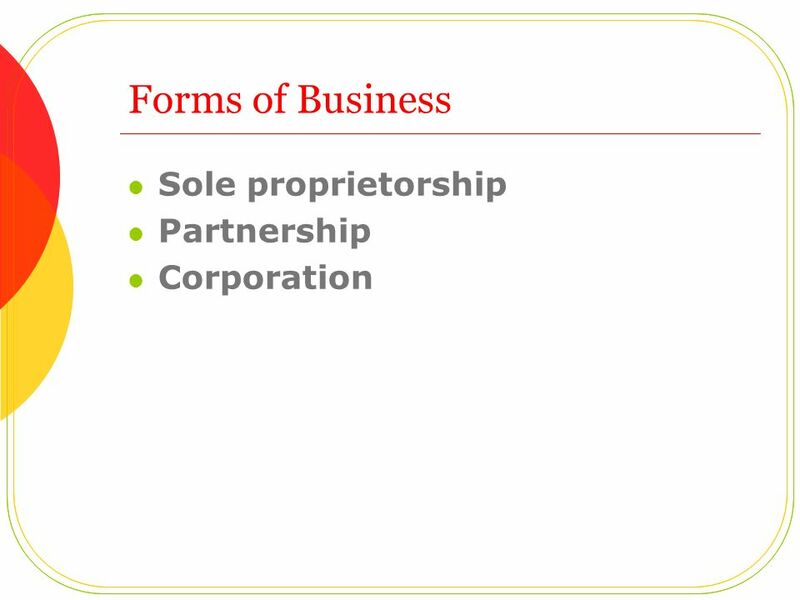 A stock represent a share in the ownership of a company. If you own a company's stock, then you are an owner, or shareholder, of the company. 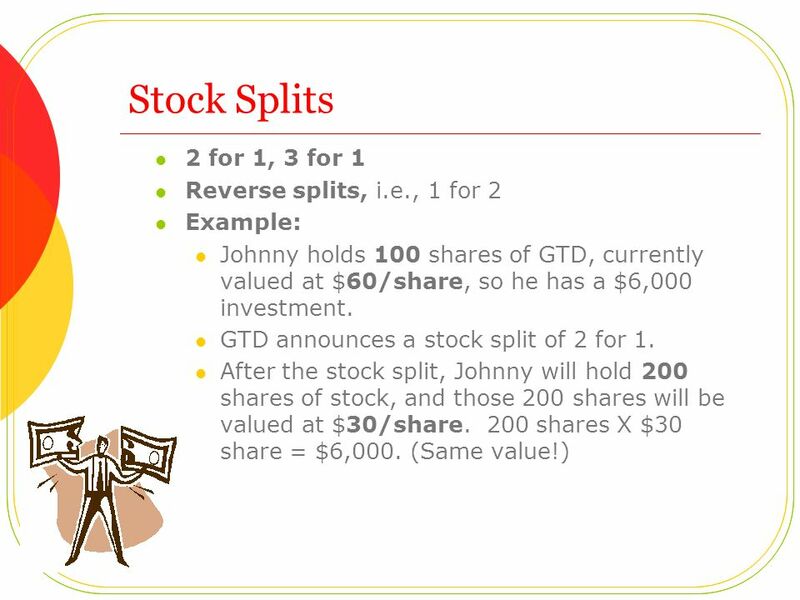 The percent of a company that you own is calculated by dividing the number of shares owned by the number of shares of stock outstanding. 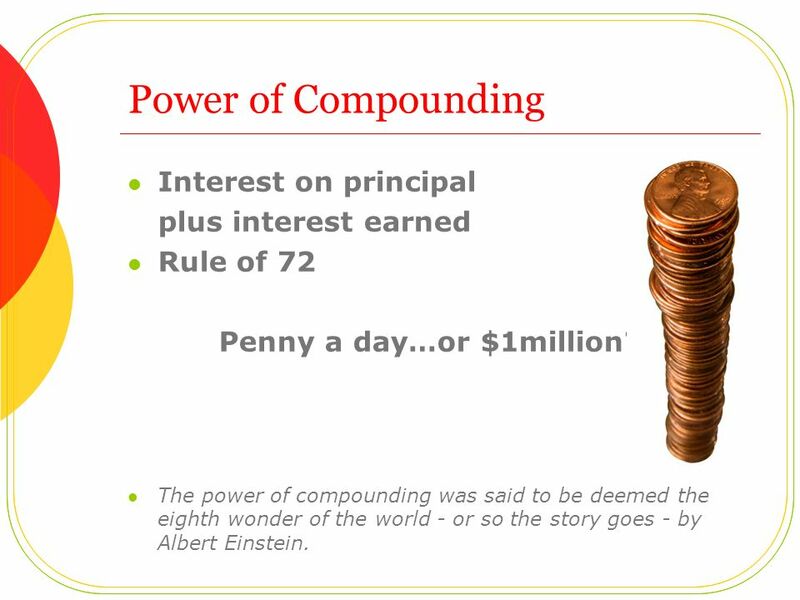 For example: 100,000 shares outstanding in company You own 1,000 shares (100,000/1000) = 1% ownership. A stock certificate represents your ownership of the company. These days, when you buy stock of a company, you usually do not get the actual stock certificates. Instead, your ownership is tracked electronically, making it easier to buy and sell shares. 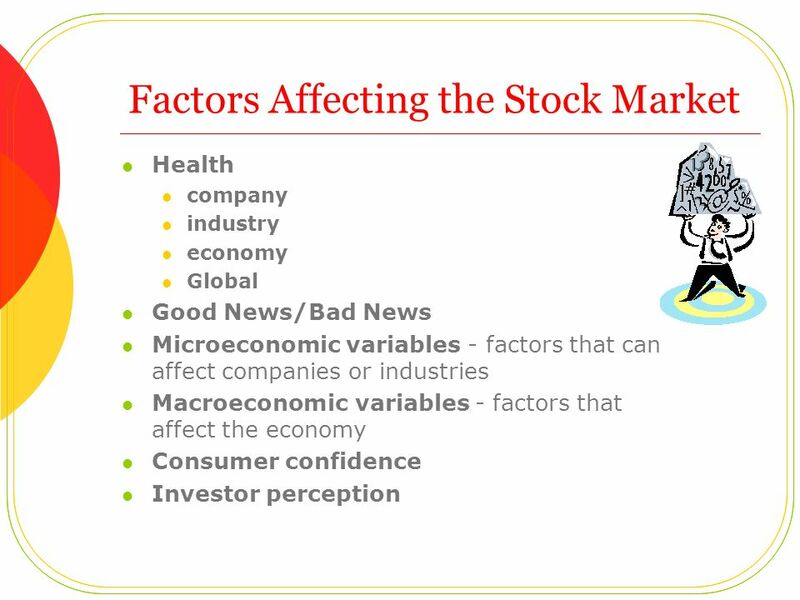 Types of Stock Common Stock When people talk about stocks in general they are most likely referring to common stock. 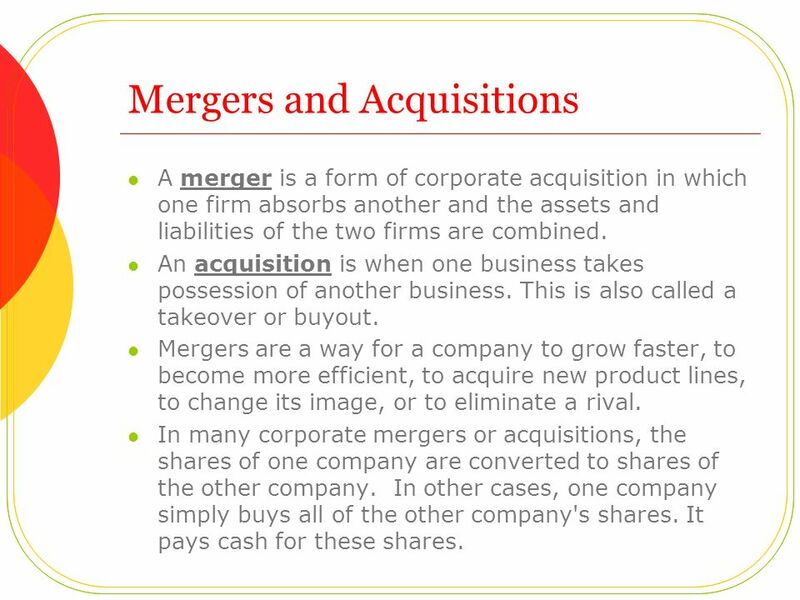 Common stock represents basic ownership of a corporation. Each share of common stock entitles the holder to one vote in the affairs of the company and one vote to elect the board members. Over the long term, common stock, by means of capital growth, yields higher returns than almost every other investment. This higher return comes at a cost since common stocks entail the most risk. If a company goes bankrupt and liquidates, the common shareholders will not receive money until the creditors, bondholders, and preferred shareholders are paid. 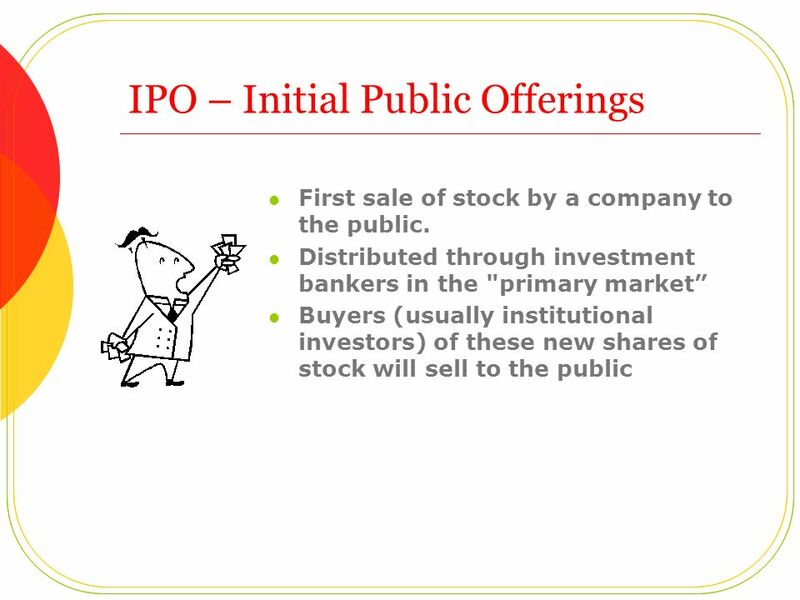 Preferred Stock Preferred stock represents some degree of ownership in a company but usually doesn't come with the same voting rights as common stockholders. Preferred stockholders receive a share of profits before common stockholders. In the event of company dissolution, preferred shareholders have a prior claim to assets ahead of common shareholders, but behind creditors. Blue-Chip Stocks biggest companies in the country Growth Stocks A growth company usually spends a lot of money on research and puts all its profits back into the company instead of paying dividends Income Stocks stable companies that pay higher-than-average dividend Cyclical Stocks move up or down in sync with the business cycle, i.e., automobile, housing, etc. Defensive Stocks unaffected by changes in the business cycle,i.e., food, utilities. Etc. Value Stocks considered undervalued by investors Penny Stocks - low-priced, speculative stocks Stock Classifications A wide variety of companies trade in the stock market. Investors use many classifications to group these companies in order to analyze and track them and to help in diversifying their portfolio. 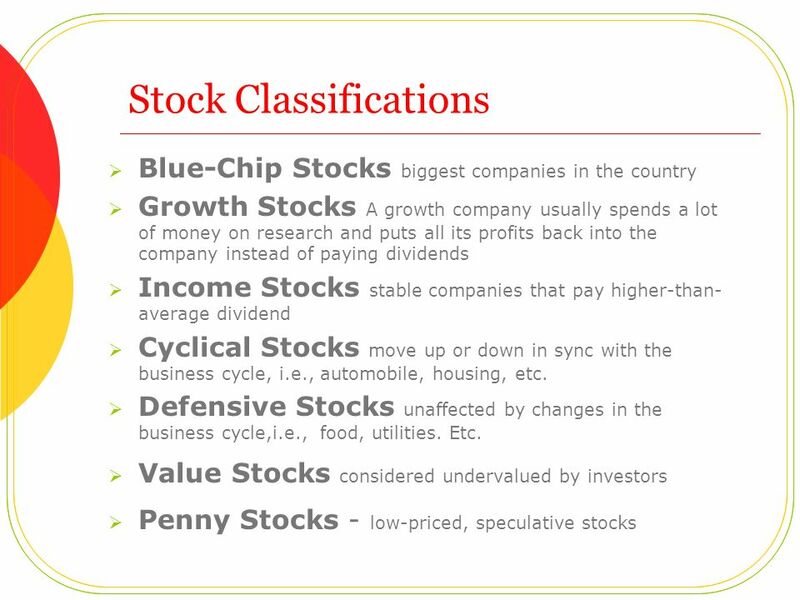 These are some popular stock classifications. Blue-Chip Stocks Blue-chip stocks are stocks of the biggest companies in the country. The term "blue chip" comes from poker, where the blue chips carry the highest value. Blue chip companies are large, established firms, with a long record of profit, growth, dividend payout, and a reputation for quality management, products, and services. These firms are generally leaders in their industries and often set the standards by which other companies in their fields are measured. Blue chip stocks are some of the safest stocks in invest in. Well known blue chips include IBM, Coca-Cola, General Electric and Microsoft. Growth Stocks Growth stocks are stocks of companies with profits that are increasing quickly. This increase in profits is reflected in the rise in the company's stock price. A growth company usually spends a lot of money on research and puts all its profits back into the company instead of paying dividends. Income Stocks Income stocks are those stocks of stable companies that pay higher-than-average dividends over a sustained period. These above average dividends tend to be paid by large, established companies with stable earnings. Utility company stocks are often classified as income stock. Cyclical Stocks Cyclical stocks are stocks that move up or down in sync with the business cycle. Company earnings and common stock prices increase or decrease with changes in business conditions or cycles. Examples of cyclical stocks include automobile, housing, steel, and industrial equipment companies. Defensive Stocks Defensive stocks are stocks whose prices are relatively unaffected by changes in the business cycle. They are generally stable and relatively safe in declining markets. 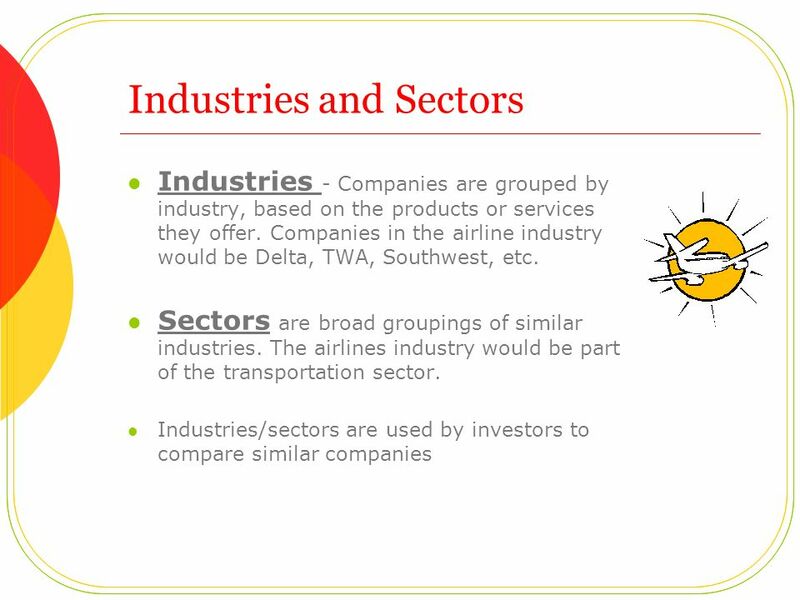 Examples are industries that produce necessities. Food, drug, and utilities companies are defensive stocks. Value Stocks Value stocks are stocks that are currently selling at a low price and are considered undervalued by investors. Companies that have good earnings and growth potential but whose stock prices do not reflect this are considered value companies. Investors who buy value stocks believe that these stocks are only temporarily out of favor and will soon experience great growth. Penny Stocks Penny stocks are low-priced, speculative stocks that are very risky. They are issued by companies with a short or erratic history of revenues and earnings. These stocks are popular among small speculators. Penny stocks are typically valued under $5.00 and can not be purchased in the Stock Market Game, due to their volatility. 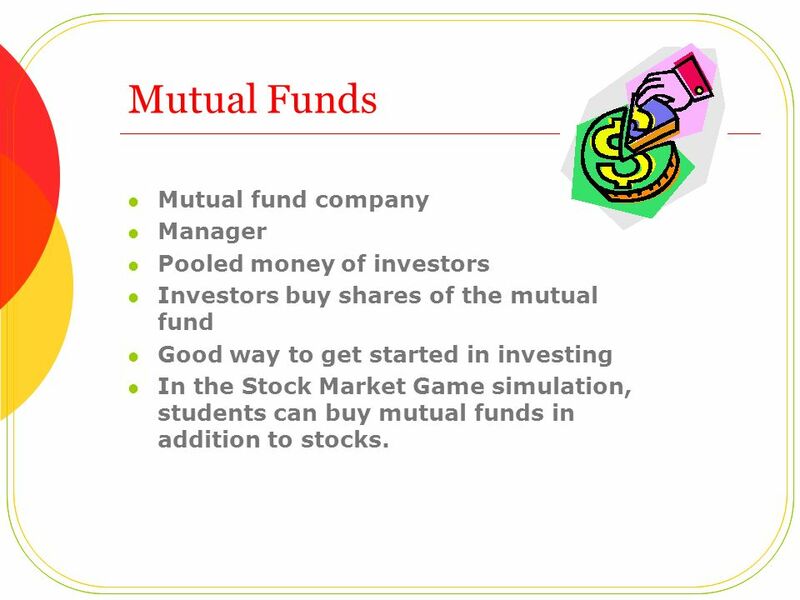 Issued by governments and corporations to raise money Investor is the lender Company/Govt repays principal plus interest (generally quarterly) Students cannot invest in bonds in the Stock Market Game. Corporate bonds are debt securities issued by private and public corporations. Companies issue corporate bonds to raise money for a variety of purposes, such as building a new plant, purchasing equipment, or growing the business. When a company issues bonds, it is borrowing money from investors. When an investor buys a corporate bond, the investor lends money to the "issuer," the company that issued the bond. In exchange, the company promises to return the money, also known as "principal," on a specified maturity date. Until that date, the corporation usually pays a stated rate of interest, generally quarterly or semiannually. Bondholders are not owners of the corporation. But if the company gets in financial trouble and needs to dissolve, bondholders must be paid off in full before stockholders get anything. Governments and municipalities also issues various types of bonds to raise money to build bridges, roads, etc. 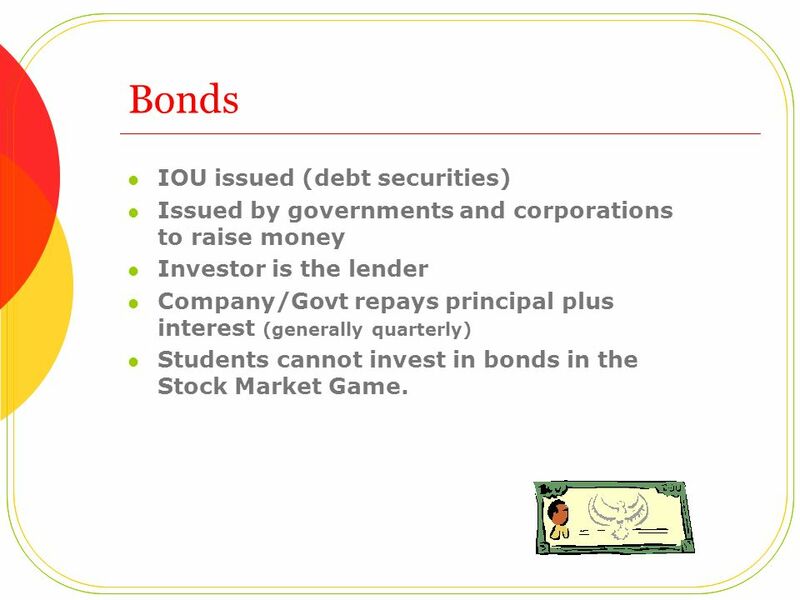 Students cannot invest in bonds in the Stock Market Game. For further information: The SIA Investor website: The Bond Market Association runs an information site. 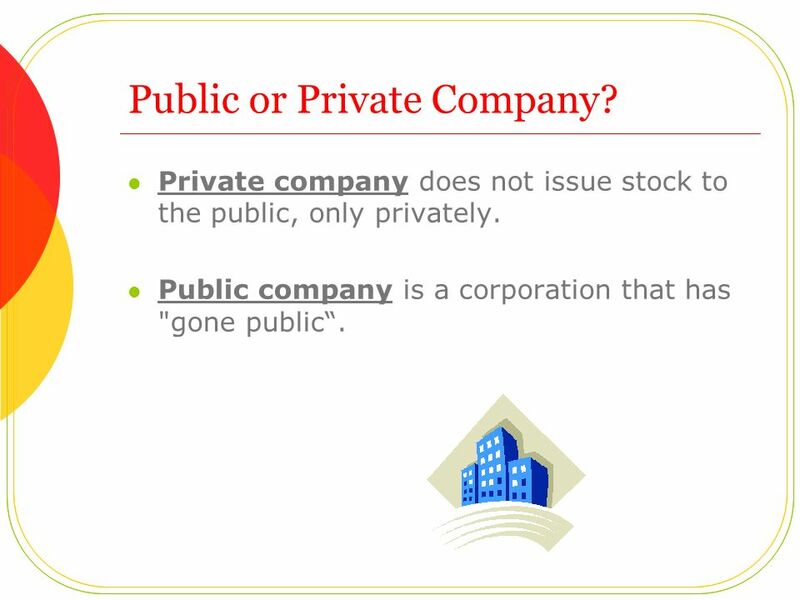 12 Public or Private Company? 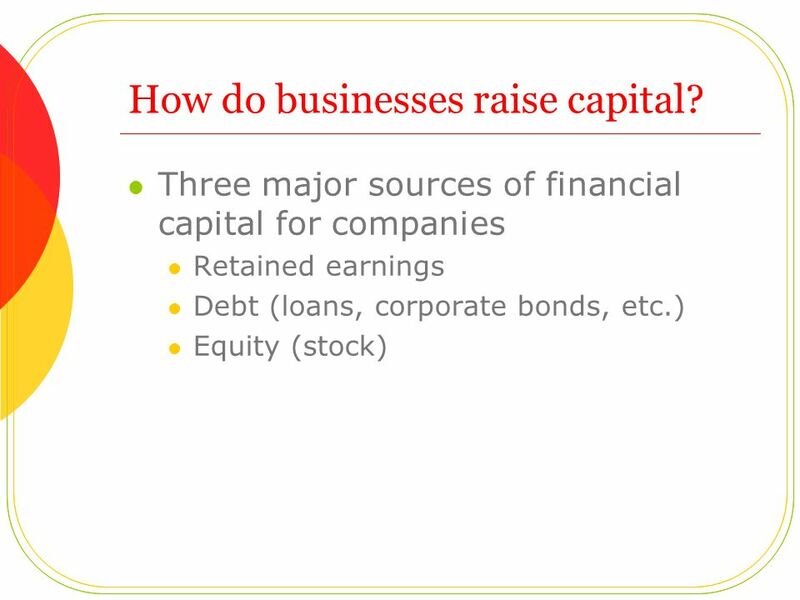 13 How do businesses raise capital? 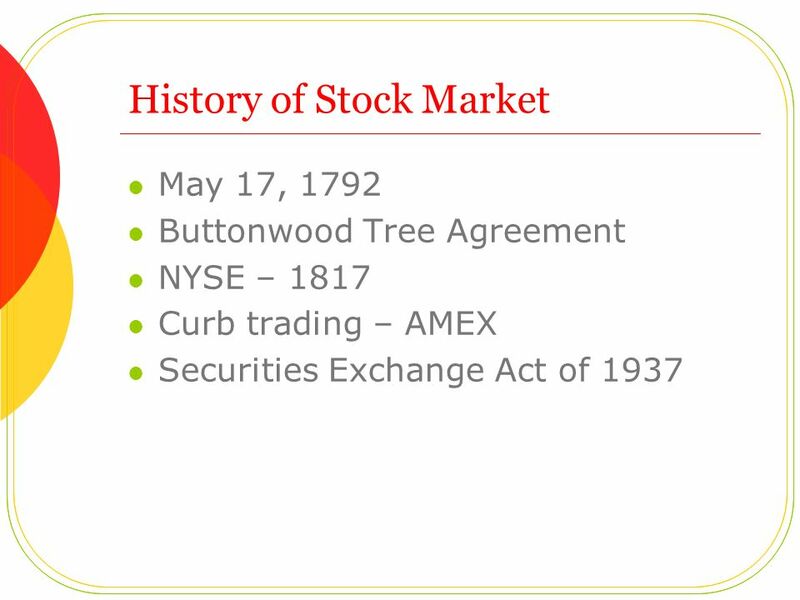 May 17, 1792 Buttonwood Tree Agreement NYSE – 1817 Curb trading – AMEX Securities Exchange Act of 1937 History of the Stock Market The United States stock market had meager beginnings. On May 17, 1792, 24 brokers signed an agreement forming the first organized stock market in New York under a Buttonwood tree at what is now 58 Wall Street. They agreed to sell shares or parts of companies among themselves and charge people a commission or fee to buy and sell shares for others. 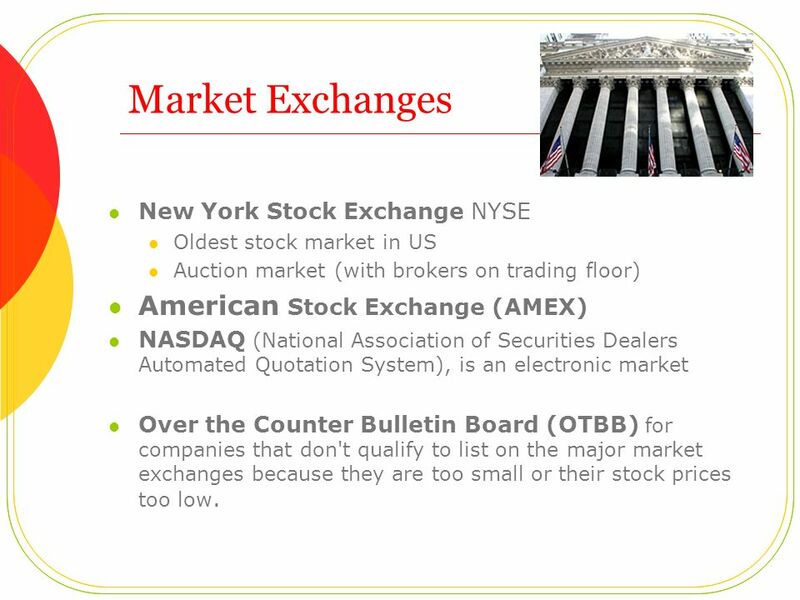 It wasn't until March 8, 1817, that a formal constitution was adopted and the first stock exchange was formed under the name "New York Stock & Exchange Board." From the late 1700s until about 1860, brokers made markets outdoors. The first stock ticker was introduced in Formal memberships in a stock exchange first became salable in In 1869, the New York Stock Exchange (NYSE) started to require the registration of securities by its listed companies to prevent over-issuance. The New York Stock Exchange was not the only way to buy stocks during the 1800s. Stocks that were not good enough for the NYSE were traded outside on the curbs. This so called "curb trading" became what is known today as the American Stock Exchange, which finally moved indoors in It wasn't until after the crash of 1929 that government regulation of the stock market was formalized with the Securities Act of 1933, to provide full disclosure to investors and prohibit fraud in connection with the sale of securities. The Securities Exchange Act of 1934 provided for the regulation of securities trading and established the Securities and Exchange Commission (SEC). In the 1940s and 1950s trading in commodities and monetary instruments became part of the stock exchanges, as well as automated trading functions. In 1971, the NYSE was incorporated and Merrill Lynch was the first member organization listed in July. Set off the Great Depression NPR Audio A stock market crash is a sudden dramatic decline of stock prices across a significant cross-section of a market. Crashes are driven by panic as much as by underlying economic factors. They often follow speculative stock market bubbles such as the dot-com bubble. 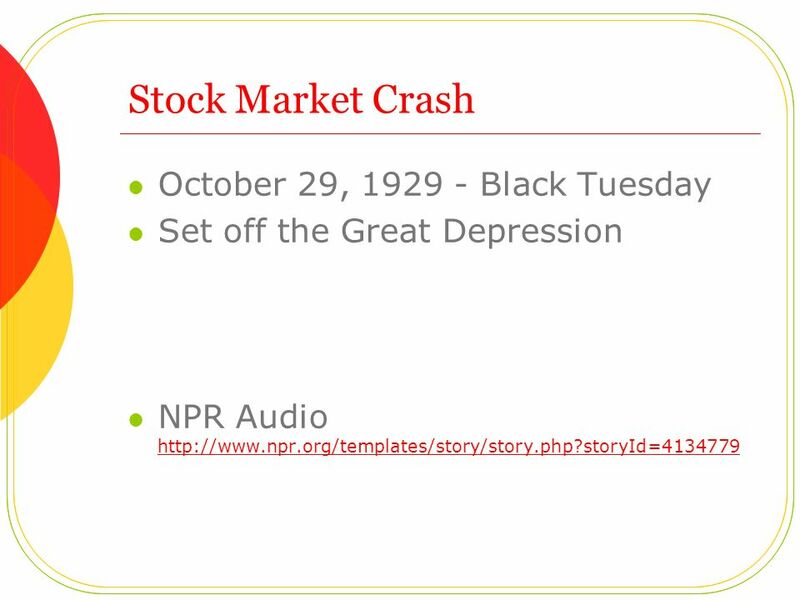 The most famous crash, the Stock Market Crash of 1929, started on October 24, 1929 (known as Black Thursday) when the Dow Jones Industrial Average dropped 50%. This event preceeded the Great Depression. The succeeding-years saw the Dow Jones drop-a-total of over 85%. Richard Armour, in his satirical American history book It All Started With Columbus, remarked that the 1929 crash occurred "near the corner of Dun and Bradstreet". There was also a crash or "adjustment" on Monday October 19, 1987, known in financial circles as Black Monday, when the Dow Jones lost 22% of its value in one day, bringing to an end a five-year bull run. The FTSE 100 Index lost 10.8% on that Monday and a further 12.2% the following day. The pattern was repeated across the world. The stock market downturn of 2002 was part-of-a-larger bear market and a Dot-com stock market bubble as well as Enron corruption that took the NASDAQ 75% from its highs and broader indices down 30%. 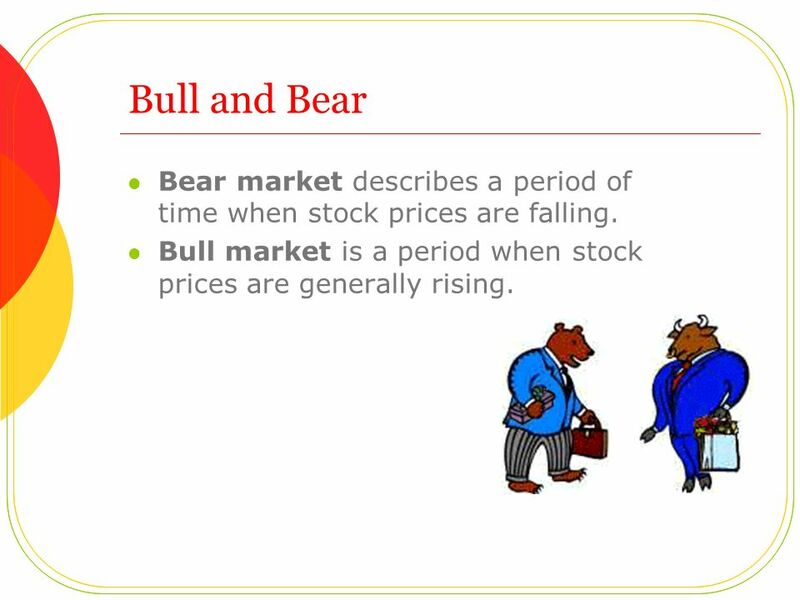 21 Bull and Bear Bear market describes a period of time when stock prices are falling. Bull market is a period when stock prices are generally rising. For those who don't spend a lot of time on Wall Street, bulls and bears refer to opposite trends in the stock market. According to Investor Words, a bull market is "a prolonged period in which investment prices rise faster than their historical average." Conversely, a bear market means "a prolonged period in which investment prices fall, accompanied by widespread pessimism." So, bulls good, bears bad. No one's quite sure how the two animals came to symbolize the market, but there are a few theories floating around. According to this article from the Motley Fool, a bear market earned its name because bears tend to swat at things with their paws in a downward motion (as in "the market's going down"). A bull market, on the other hand, got its name because bulls swing their horns upward when they strike (as in "the market's going up"). Another theory proposes that the animals' personalities are behind the symbolism. Bears move with caution, while bulls are bold and like to charge ahead. So a "bearish" investor thinks the market will go down, while a "bullish" investor thinks it's headed up. Certainly no one can argue that both animals are intimidating and best avoided. Maybe they're meant to serve as a warning to investors: Unless you know what you're doing, you could be headed for pain. 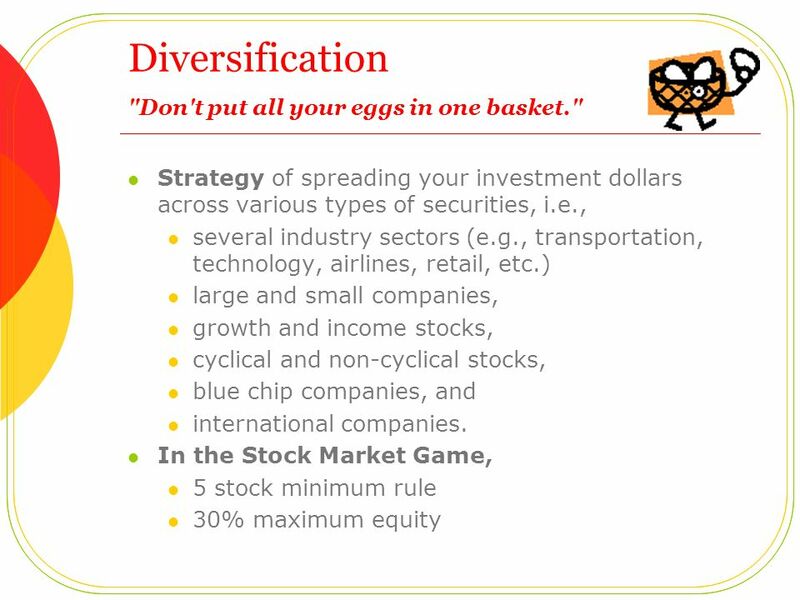 23 Diversification "Don't put all your eggs in one basket." more buyers than sellers – price goes up! More sellers than buyers – price goes down! Stock prices change every day as a result of market forces. By this we mean that share prices change because of supply and demand. 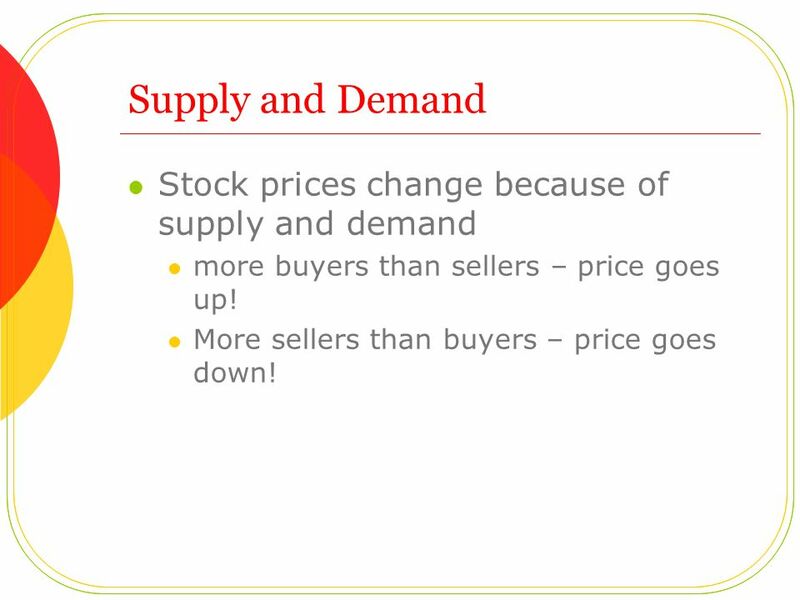 If more people want to buy a stock (demand) than sell it (supply), then the price moves up. Conversely, if more people wanted to sell a stock than buy it, there would be greater supply than demand, and the price would fall. To help students understand, give them examples like E-Bay, or an auction. Operating efficiency Management Financial performance Profit/Loss, EPS, P/E, etc. Position in Industry Different investment professionals analyze stocks in different ways. There are two basic approaches that investors use: fundamental analysis and technical analysis. 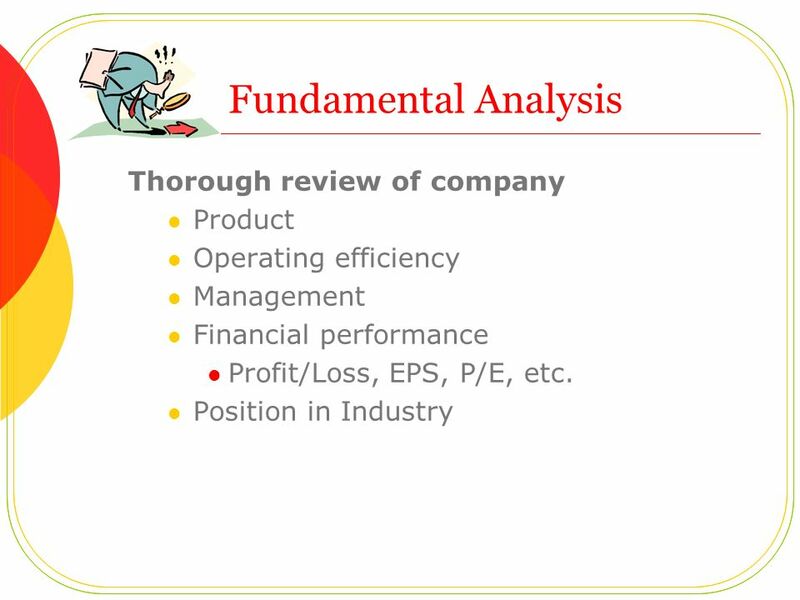 Fundamental Analysis Fundamental analysis focuses on a thorough review of the basic facts about a company, including its product, operating efficiency, management and financial performance. Fundamentalists will evaluate many ratios and financial figures before deciding if a stock should be purchased or sold. Comparing these measures over time and to companies in similar industries gives an indication of the company's current value. Some of the more significant financial factors reviewed include book value, earnings per share (EPS), price/earnings ratio (P/E), etc. 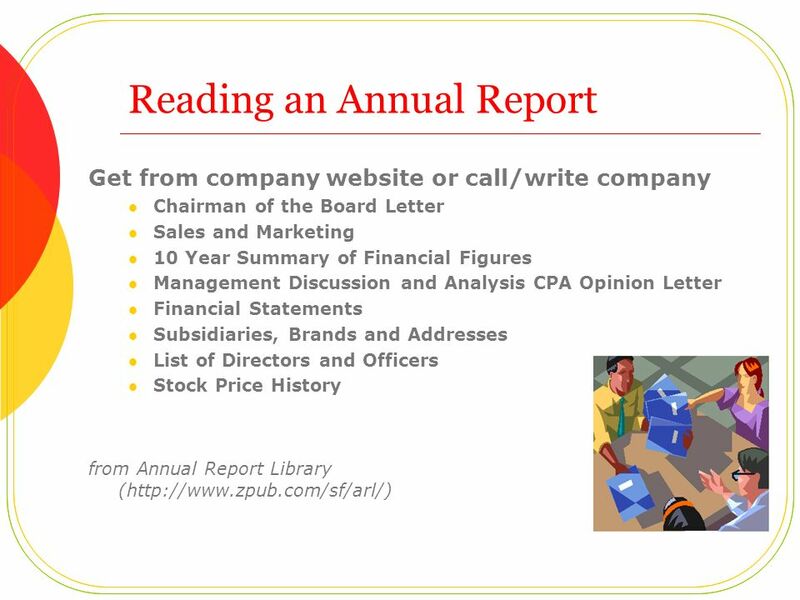 : Much of this information can be found in annual reports, Form 10-Ks filed with the Securities and Exchange Commission, articles and research reports. Fundamentalists may also look at the economy at large--such as unemployment and interest rates--to estimate a stock's potential. 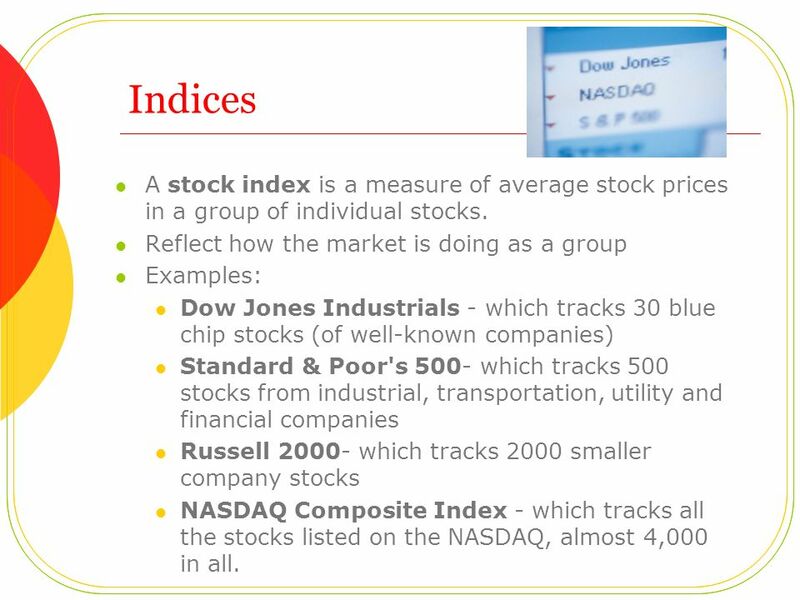 In the Stock Market Game, many students use fundamental analysis--usually at a very basic level: researching the company's products, efficiency, and financial performance and its position in the industry and the economy at large. 27 Technical Analysis Used to evaluate the worth of a stock by studying market statistics. Stock and stock market trends Charting Technical analysis is the practice of studying the stock market's past in an attempt to determine its future. People who utilize technical analysis often study charts and graphs of a particular stock, industry, and / or sector to try and find patterns. 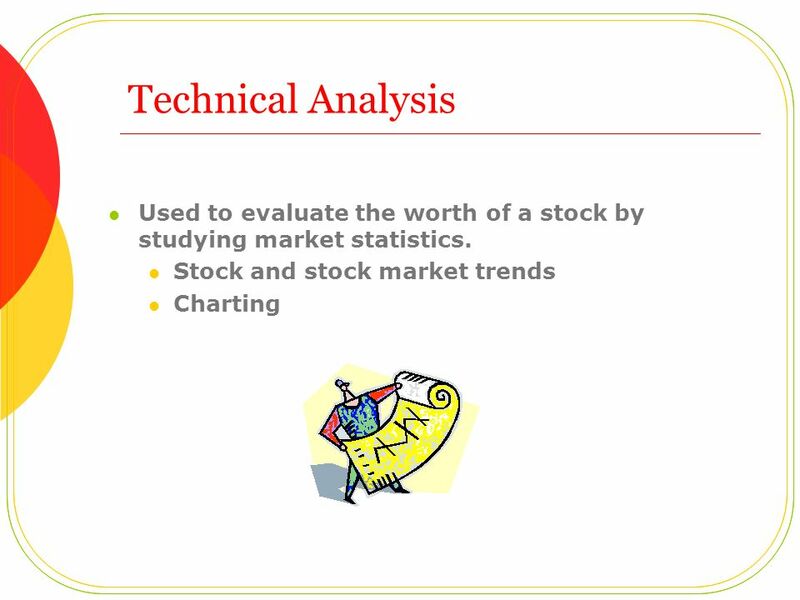 Technical analysis is a form of stock evaluation that relies on stock data, such as price movement, volume, open interest to predict future price trends. Technical analysis is not concerned with the business, but focuses strictly on the data, using charts and graphics to spot trends and certain buy and sell points. 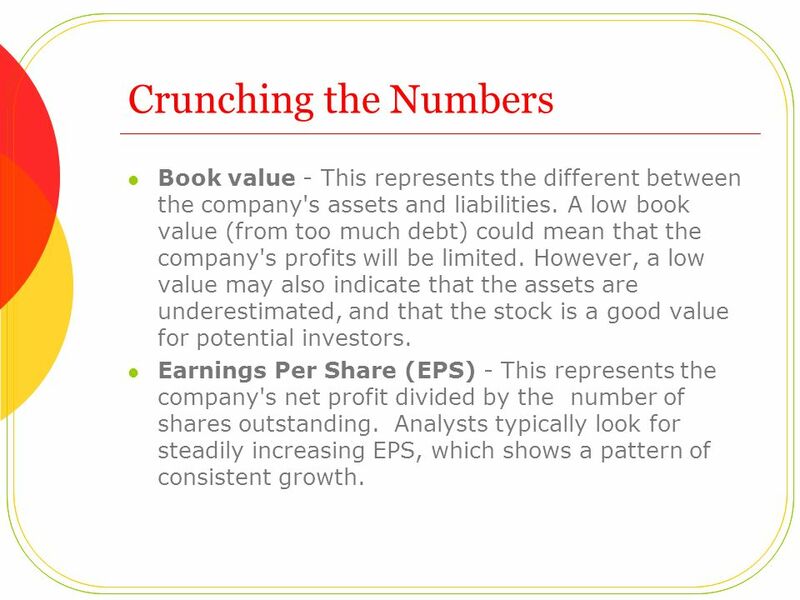 28 Crunching the Numbers Book value - This represents the different between the company's assets and liabilities. A low book value (from too much debt) could mean that the company's profits will be limited. However, a low value may also indicate that the assets are underestimated, and that the stock is a good value for potential investors. Earnings Per Share (EPS) - This represents the company's net profit divided by the number of shares outstanding. Analysts typically look for steadily increasing EPS, which shows a pattern of consistent growth. 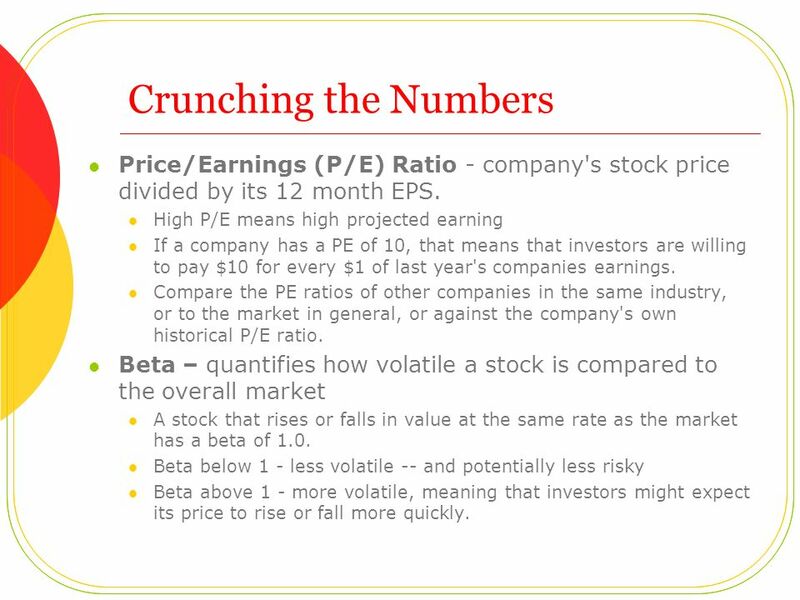 29 Crunching the Numbers Price/Earnings (P/E) Ratio - company's stock price divided by its 12 month EPS. High P/E means high projected earning If a company has a PE of 10, that means that investors are willing to pay $10 for every $1 of last year's companies earnings. Compare the PE ratios of other companies in the same industry, or to the market in general, or against the company's own historical P/E ratio. Beta – quantifies how volatile a stock is compared to the overall market A stock that rises or falls in value at the same rate as the market has a beta of 1.0. Beta below 1 - less volatile -- and potentially less risky Beta above 1 - more volatile, meaning that investors might expect its price to rise or fall more quickly. 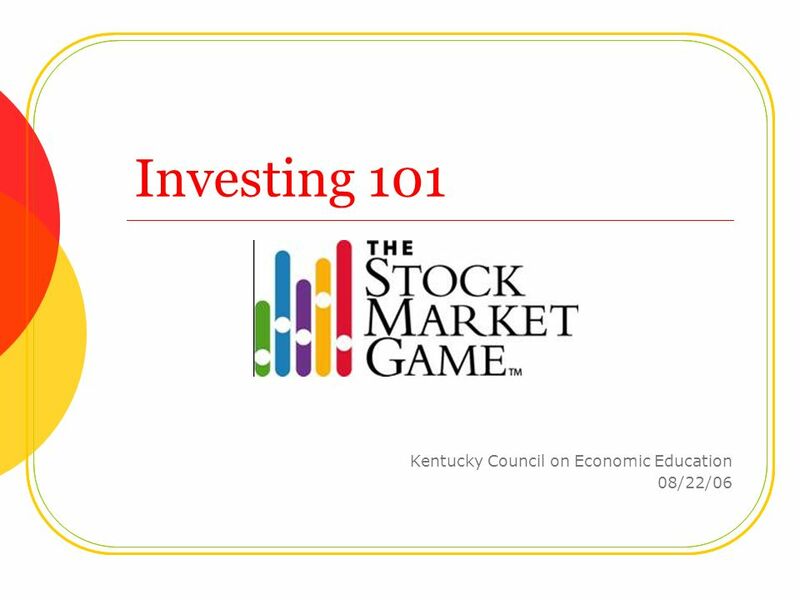 Download ppt "Kentucky Council on Economic Education 08/22/06"
G1 © Family Economics & Financial Education – Revised November 2004 – Investing Unit – Language of the Stock Market Funded by a grant from Take. Investing in Stocks Chapter 12 Goals for Chapter 12.1 Describe the features of common stock and compare it to preferred stock. Discuss stock investing. 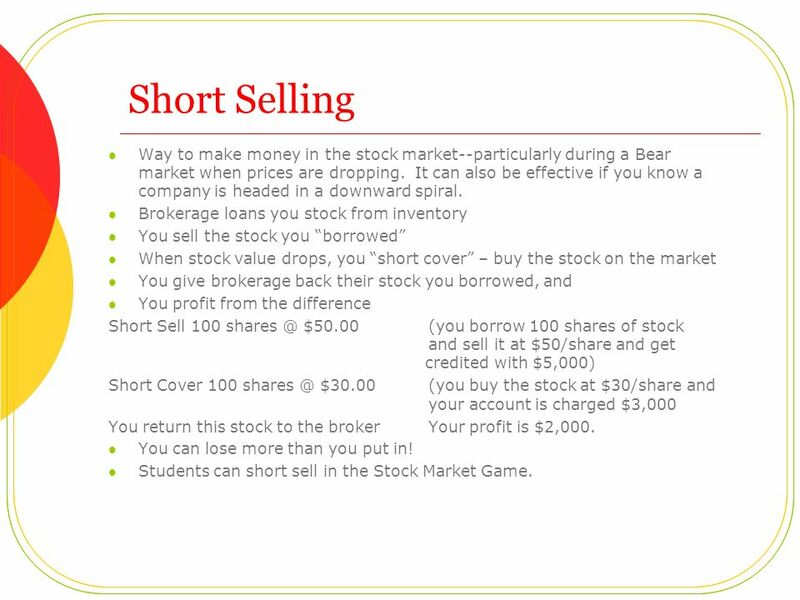 Chapter © 2010 South-Western, Cengage Learning Investing in Stocks Evaluating Stocks Buying and Selling Stock 12. The Stock Market. What is Stock? Stock represents ownership in a company or rather a publicly traded corporation. Buying stock is an investment in the. Investing: Taking Risks With Your Savings. Stocks are also known as securities As proof of ownership, you get a stock certificate Stocks What are they? 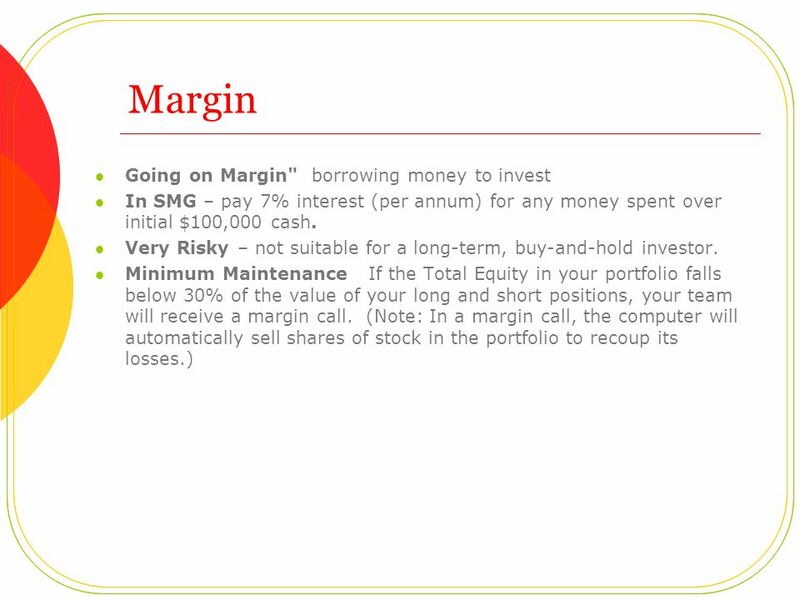 Investing: Risking money to make money Chapter 2: Saving and Investing. The Stock Market. What is Stock? 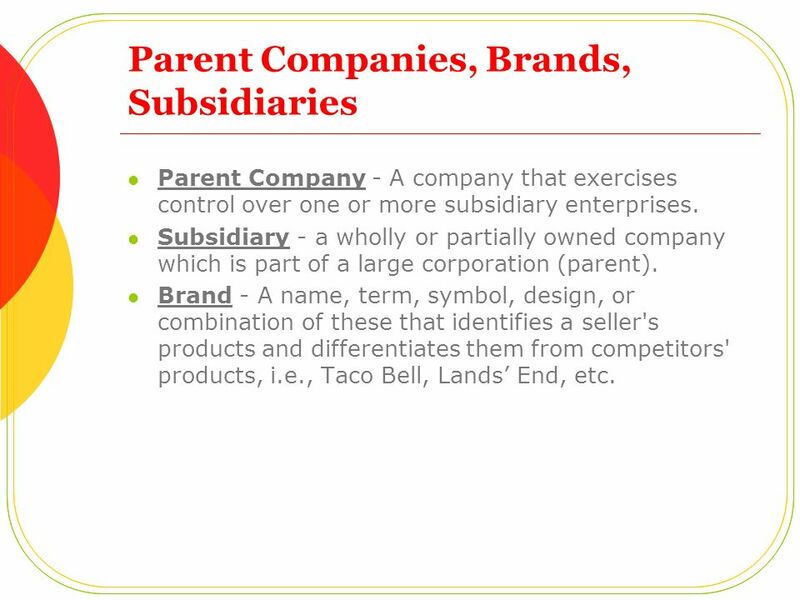 Stock represents ownership in a company. Buying stock is an investment in the company. The stock market is a medium for. Financial Literacy. 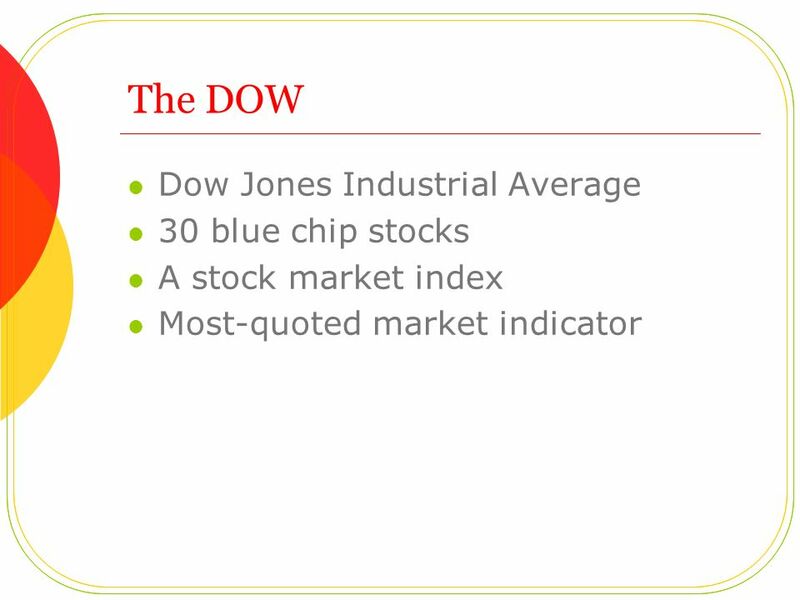 Why Learn About Stocks  The stock market is the core of America’s economic system Stock is a share of ownership in the assets and. Buying Stock: Corporations sell stock to raise funds. 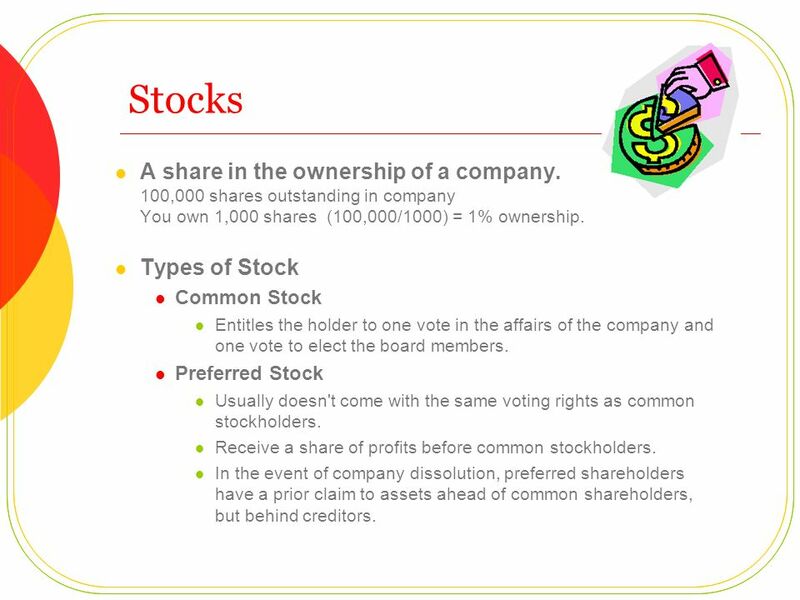 Stock represents ownership in the corporation and is issued in portions called shares.  Financial investment is putting money into something with the expectation of gain. 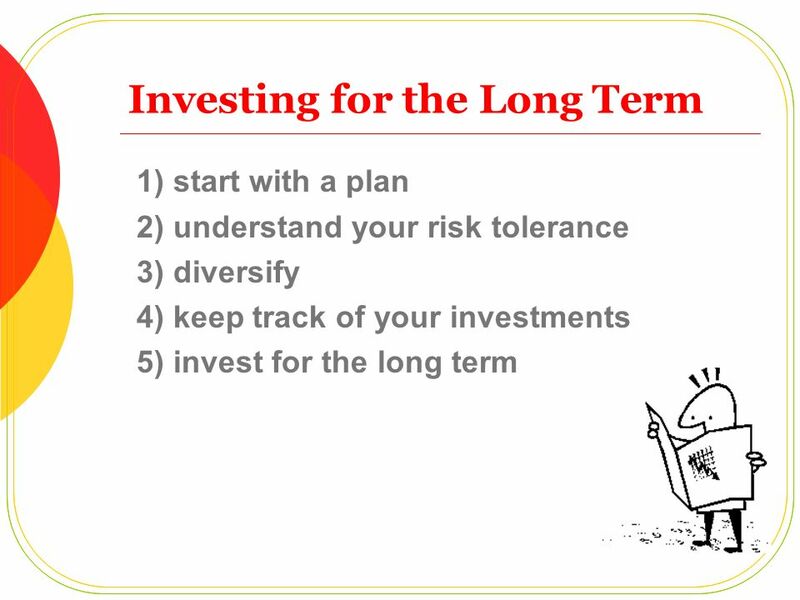  Investing requires thorough analysis of the investment opportunities. Chapter Investing in Stocks 12.1 12.1Evaluating Stocks 12.2 12.2Buying and Selling Stock 12.